Welcome to a world of make believe, where wishes come true and everything's magically sparkly! 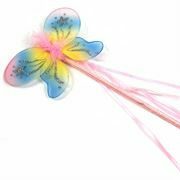 Fairygoodies presents a wide range of high quality dressing up products, from fairy wings and wands to head garlands, pixie ears and lots more. We've something for fairies of all ages and sizes, and all budgets too! All our fairy wings, dresses and other items are CE approved to the latest standards, including fire retardency. Wholesale fairy products- we offer a wide range of our products here as wholesale supply to retailers in the UK and Europe. If you're a shop interested in our ranges, please contact us for further information and wholesale prices. Fairy wings come in all shapes and sizes- here you'll find a great selection of wings, mostly with matching fairy wands, to suit all sizes of fairy. All our fairy wings are CE approved for ages three and above, and most fit adults as well as children. Wholesale fairy wings: all fairy wings on this site are available for wholesale purchase. If you are a retailer and you'd like to stock our products, please register using the button at the top right of the page. Our fairy dresses and princess dresses will make you the belle of the ball! Made from quality fabrics with the latest CE and fire retardency tests, our dresses are colourful, detailed and long lasting. All our fairy dresses come in three sizes, to fit ages 2 to 8 years.